Filmmaker Roger Larivière at a Veteran's War Memorial, High Bridge, NJ. August, 2017. So it's been quite a bit of time since I last posted and quite a bit has happened. I visited High Bridge, New Jersey with Roger Larivière, who is working hard to film what will be a brand new documentary loosely titled Space Brother Contacts Revisited. Another groundbreaking event just happened a few days ago when I was contacted by a woman named Margaret Archibald. We spoke for a couple of hours and was fascinated by her connection to the supernatural. Margaret recounted a number of UFO sightings she experienced and emailed me pictures and videos. Margaret told me she told me about a friend she wants to introduce me to who's adopted mother was at High Bridge when Valiant Thor and his crew made contact at Howard Menger's farm in 1958. The man's name is Eddie Page. I spoke to him on the phone for quite a while and was blown away by the info he gave me regarding his knowledge of Valiant Thor. I will be posting more information in the near-future. The reason for the delay is simply that it is LOTS of info to by synthesized. Moreover, it overturns a significant amount of what Dr. Frank E. Stranges reported... stay tuned!!! Posted in Dr Frank E Stranges, Eddie Page, Margaret Archibald, Roger Larivière, Valiant Thor. Tags: valiant thor on May 5, 2018 by Adam Milat-Meyer. That's right folks, it's hard to believe it has been quite that long but sixty years has come to pass since the day everything changed when President Dwight D. Eisenhower and Vice President Richard M. Nixon met Valiant Thor shortly after he landed in Alexandria, Virginia on March 16, 1957. I'll give you an update on what's been going on since the last time I posted. I'm planning a trip to High Bridge, NJ in a couple of months with Roger Larivière to the very spot where August C Robert shot black and white along with a few color photos that will never be forgotten. I've heard that it's off limits and if that's the case, perhaps we will check the surrounding areas or even better, we can scrap the trip to High Bridge, NJ and head down to Alexandria, VA! I also wanted to thank Beverly Klatt for getting in touch with me and talking about how when she was growing up in Alexandria, VA during the early 1960's she spoke to a classmate who explained that his father who worked for the government, was in contact with aliens from the planet Venus. This was before the story had broke to the public and so it is very interesting that she would've heard this at that time. Over the next few months I plan to speak more with Ms. Klatt regarding this encounter; it's one that most certainly is not widely discussed--and this is very exciting! Last but not least, I'm proud to say I made a fairly large contribution to NICUFO. I called up Julie Ann Stranges, wife of the late, great Dr. Frank E. Stranges, and wired NICUFO the money right over the phone. It was easy and it made me feel a whole lot better... Mrs. Stranges is struggling financially right now and any donations would help. Why not click on that link and order a copy of Stranger at the Pentagon or better yet, you can become a subscriber to the monthly "Inter Space Link Newsletter" for $125.00 USD per year. For a number of years I've been a subscriber and I promise you that you WILL NOT be disappointed with it! Posted in Human-looking extra terrestrials, NICUFO, Roger Larivière, Stranger at the Pentagon, Valiant Thor, Valiant Thor press. Tags: August C Robert, High Bridge, Julie Ann Stranges, NJ on March 16, 2017 by Adam Milat-Meyer. As you know, I'm huge fan of all that Craig Campobasso has done in making the film version of Dr. Frank E. Stranges classic, breakthrough novel, Stranger at the Pentagon. I spend a large chunk of my life explaining this story to anyone who will listen and I can tell you, nothing goes farther than TV and film. Can't tell you how many times I've spoken to people about this case and they only know what appears on the hit Show Ancient Aliens. Ancient Aliens episode name is "The Mysterious Nine." Don't get me wrong, I LOVE Ancient Aliens, but the one piece of criticism I have is simply this: THEY ARE TOO ANCIENT. We want to know about what's going on now. There are plenty of modern day contact cases that go ignored by the show. Okay, it's beyond the scope of their program, I get it... but how about a mention of Valiant Thor. Somebody? -- Please?? Well now: It looks like my wish has been granted! I sent a message via Twitter and Facebook to Ancient Alien's main accounts about a year ago asking that they put Craig on the show AND THEY LISTENED!!! This site has seen a massive spike in hits since the news broke. You can see there are lots of searches for Valiant Thor, Laura Eisenhower, etc. This must mean the show already aired and I'm in a different time zone or what have you. Anyway, below is a screen capture of the recent web traffic and don't forget to watch the show. Posted in Craig Campobasso, Dr Frank E Stranges, Laura Eisenhower, Stranger at the Pentagon, Valiant Thor, Valiant Thor press. Tags: Ancient Aliens, Council of the Nine, Mysteries of the Nine on July 9, 2016 by Adam Milat-Meyer. As many of you know, I was invited to give a lecture on May 26, 2016 on Valiant Thor for the Mutual UFO Network (MUFON), in Las Vegas, Nevada. It couldn't have gone better: A full house was on hand for the slide show and Q&A and everyone paid attention and asked LOTS of questions! Adam Milat-Meyer discussing the famous pictures of Valiant Thor and his crew from Victor 1 shot by August C. Robert at Howard Menger's farm in 1958. The event lasted about two hours so it's too much to recap here. MUFON member Chris Zuchari filmed most of it and I will soon be releasing this footage on YouTube. It was surprising to see the audience so engaged! I'm hoping that when this video goes live, there will be an equal amount of interest with the public. In giving this lecture, the most rewarding thing was being able to inform everyone about the National Investigative Committee on Unidentified Flying Objects (NICUFO). The 501(c)(3) nonprofit is the best source of information you can find on Valiant Thor and his mission. By subscribing to the Inter Space Link Newsletter, started by Dr. Frank E. Stranges in 1980, you will find out unbelievable, untold information, on anything and everything. I've been a subscriber for years and I can assure you that you will not be disappointed!!! Nick Bensond with Dr. Frank E. Stranges and Denise Stranges in Kitchener, Ontario. ca. 1980. The Space Brother Contactees of the 1950's: Howard Menger, Daniel Fry, George Adamski, George Van Tassel, and of course I dedicated the most time to the late, great, Dr. Frank E. Stranges. I discussed the Alan Alda contact case and must thank UFO investigator and longtime friend of Dr. Frank, Nick Bensond, for allowing me to use the video he filmed from an early Inner Circle meeting where Dr. Frank Stranges when he discussed his encounter with Alan Alda while he was with Vice Commander Donn Thor on an airplane headed to Las Vegas, Nevada. When dealing with August C. Robert, it's more than difficult to find photos and information on the former Air Force photographer. I was delighted to have a clip of him being interviewed in a 1950's documentary on UFOs. Special thanks Roger Larivière for providing the footage. Adam Milat-Meyer guest lecturing at MUFON Nevada. I want to thank Donna Carbone and Chris Zuchari for all of their hard work organizing and producing such a successful event. I also want to thank Shahrokh Mohammadzadeh for driving me around town and talking about MUFON and related endeavors... and Jerry Spinner for having me stay over for a few days. Hanging out, showing me not just where to play but HOW to play cards... was both informative and entertaining and I'm excited to report that I returned to Brooklyn, New York, with a $25 plus in poker winnings. It may not seem like a big deal, but I was prepared to lose $400! It could be that I'm a stronger player than I thought, but there's no denying Jerry, AKA, "Brooklyn Jerry" taught me a whole lot--and I'm grateful to be able to learn from someone with his level of professional skill and expertise. Don't forget to check back here soon. I'm editing video for the event that I hope you all will RT, Like, and share all over the interweb. God Bless and thanks to everyone for all your hard work. It was an honor and a privilege to be a part of this event. Posted in Alan Alda, Craig Campobasso, Dr Frank E Stranges, Events, George Van Tassel, Human-looking extra terrestrials, NICUFO, Roger Larivière, Stranger at the Pentagon, Valiant Thor, Venusians. Tags: donn thor, MUFON, MUFON Nevada, venus on June 1, 2016 by Adam Milat-Meyer. Guest lecture event for MUFON Nevada! I am excited to announce that I will be appearing as a guest lecturer for MUFON Nevada in Las Vegas at 7PM Thursday, May 26th 2016. Location is McMullan's Irish Pub at 4650 W Tropicana Ave #110, Las Vegas, NV 89103. Donna Carbone, Director of MUFON Nevada, went through a lot to make these events happen, so I just wanted to officially thank her for all of her hard work in making MUFON events remain free. I say free--but there may be a suggested donation--I'm going to check on that right now. For sure the venue wants everyone to order food and beverages and I certainly cannot encourage this enough. Gabrielle Napolitano, my future wife, is an expert graphic designer and I want to thank her for making the above event poster. The UFO pictured isn't exactly what I asked for, but I think the whole thing looks interesting and it's upstart, attention-grabbing-look gets the job done in a big way... Thanks Gab! Van Tassel, Menger, Adamski, etc. Remember, these are just a few of the topics I will be covering. Most of what I do will be a screen show and a Q&A. I've been refraining from posting on this site for the last few months because I was saving it for this event so please, DON'T MISS IT!!! Posted in Events, Human-looking extra terrestrials, Valiant Thor press, Venusians. Tags: Donna Carbone, MUFON Nevada on May 20, 2016 by Adam Milat-Meyer. It's been over three months since I posted and lots has happened since then. I've been talking with Chad C Meek, a writer, director, and executive producer who has taken his own early childhood UFO abduction experiences, and time spent with his uncle, George Van Tassel, to tell an epic story about the early space contactee's movement that occurred at Giant Rock, in California's Mojave desert. Please note that Giant Rock the Movie will be a major motion picture release so PLEASE: only serious inquiries are needed. Also, everyone knows about kickstarter, indiegogo, and gofundme.com -- this is beyond that and there you do not have to waste time drawing attention to the obvious. What is needed are serious investors who understand the movie production and distribution. Soon there will be more news but for now, check out Chad's websites and follow him on social media. He does lots of speaking engagements and most recently did one for MUFON Nevada. If you have a TV, radio, or podcast show and would like Mr. Meek to be a guest, please fill out the form on this link. Posted in Events, George Van Tassel, Human-looking extra terrestrials. Tags: Chad C Meek, Giant Rock, Giant Rock the Movement, Giant Rock the Movie, MUFON on March 7, 2016 by Adam Milat-Meyer. Last post I did here was early last month and I'm sorry for the delay. I posted the interview I did on the daily podcast, Spaced Out Radio. The host Dave Scott was great and so was Roger Larivière and thanks again you guys for all that you do. As for me... I have to be honest... I AM NOT HAPPY. There was much I meant to talk about but forgot to mention. It also took too long for me to get my point across for most of the questions and I was saying "uhh" and "umm" before and after every statement. What can I say? I'm not big into public speaking or doing interviews, but I thought it would help the cause, so I agreed to it and it's done. Beneath the video posted on YouTube, I posted this comment: "2:35 min mark Dr Frank describes how he and Donn Thor (Valiant Thor's brother) spoke at length with Alan Alda on an airplane flight. Mr Alda should talk to the public about this!" 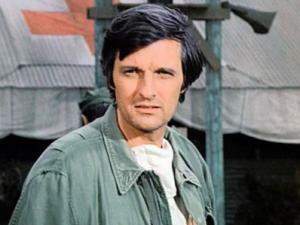 I already tried to contact Alan Alda on social media, but to no avail. I'll try to reach him again after some time has passed. He's still working as an actor and he also does lots of nonprofit work, the Alda Alda Center for Communicating Science is particularly AWESOME. Being that he has a busy schedule, I'll wait a few months before trying to get in touch with him again. It's very possible the Alan Alda was not there and Dr Frank and Vice Commander Donn were talking to someone who looks like award winning actor. The video I want to make will take a couple of weeks to produce because well, it takes me a long time to do everything. If anyone wants to do it for me, be my guest, but make sure you ask Nick Bensond's permission first. He's easy to find online and if you are serious about this but you are having trouble, let me know by contacting me through this form. So thank you for your time and interest in the Dr. Frank with Donn Thor and Alan Alda Contact Case. Merry Christmas and a Happy New Year to you all! Posted in Alan Alda, Dave Scott, Dr Frank E Stranges, Human-looking extra terrestrials, Roger Larivière, Spaced Out Radio, Valiant Thor press, Venusians. Tags: donn thor on December 13, 2015 by Adam Milat-Meyer. Thanks Dave Scott and everyone at Spaced Out Radio for having me on the show. Their nightly podcasts are always informative and entertaining. Follow, favorite, and ReTweet them on twitter: @SpacedOutRadio and like them on Facebook. Special thanks to Roger Larivière for being on the show and stay tuned for his own interview on Spaced Out Radio. Larivière has done excellent work translating info about the Valiant Thor story from English to French. He also organizes annual conventions in Quebec. A number of people who help the cause were mentioned. Dr Frank Stranges widow, Julie Ann Stranges, still runs the National Investigative Committee on Unidentified Flying Objects (NICUFO). I highly recommend you subscribe to their monthly newsletter. I cannot overstate the importance of the video work of Nick Bensond. His YouTube channel has the most important videos on Dr Frank Stranges' lectures. Craig Campobasso is mentioned throughout this site and on Spaced Out Radio as well. His short movie of Stranger at the Pentagon can be purchased here with a small donation. Posted in Alan Alda, Craig Campobasso, Dave Scott, Dr Frank E Stranges, Events, Human-looking extra terrestrials, NICUFO, Roger Larivière, Spaced Out Radio, Stranger at the Pentagon, Valiant Thor press, Venusians. Tags: Adam Milat-Meyer, Christianity, Dead Sea Scrolls, donn thor, Jesus Christ, Jill, Nick Bensond, podcast, stranges, valiant thor, Victor 1, Victor Class on October 28, 2015 by Adam Milat-Meyer. Valiant Thor will be the main subject of my interview on Space Out Radio on October 27th, 2015. A few days back I contacted Spaced Out Radio host, Dave Scott, to make sure the info on the flyer is correct and he approved! 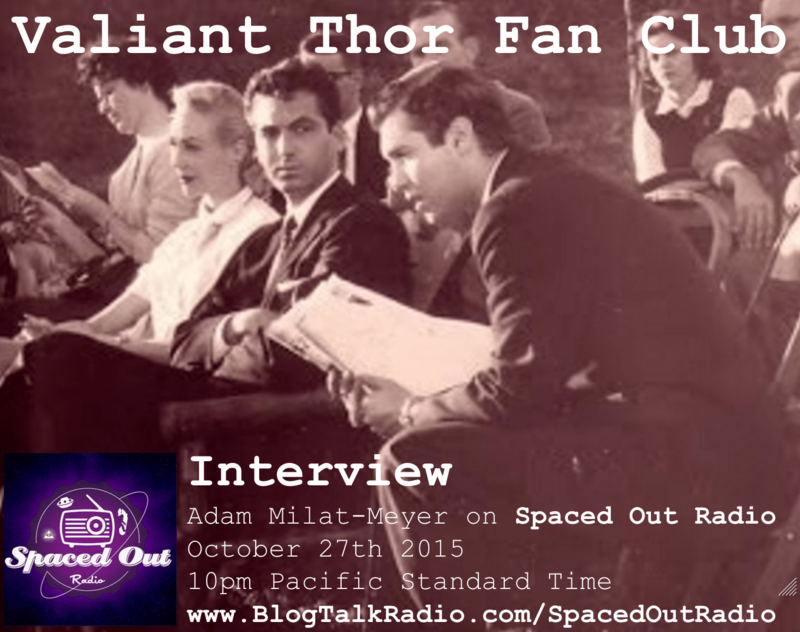 Adam Milat-Meyer, founder of the Valiant Thor Fan Club will be on Spaced Out Radio Oct 27th 2015. Keep in mind that Valiant Thor Fan Club on Spaced Out Radio airs from Vancouver, British Columbia in Canada. Program runs two hours starting at 10PM Pacific Time, which means it will air in New York City at 1:00AM on 10/28/15. During the show there will be a phone number displayed here for you to call in. There also will be a live chatroom during the broadcast... We encourage you to participate! Thank you so much and hope to here from you soon! Posted in Alan Alda, Dr Frank E Stranges, Events, Human-looking extra terrestrials, Spaced Out Radio, Stranger at the Pentagon, Valiant Thor press, Venusians. Tags: Adam Milat-Meyer, Blog Talk Radio, Dave Scott, human-looking aliens, Spaced Out Radio on October 22, 2015 by Adam Milat-Meyer. Dr Frank E Stranges founded NICUFO and also had a group of select followers called the "Inner Circle." Their meetings continued right up until shortly before Dr Frank's passing in 2008. Recently, Inner Circle member Nick Bensond, posted a number of videotaped meetings on YouTube that are for sure worth watching. In one of those videos, Dr Frank told a story of how he was taking a domestic commercial flight with Vice Commander Donn Thor, Val's brother, who is pictured in the iconic photographs taken by Augie Roberts at Howard Menger's home in High Bridge, New Jersey. Dr Frank E. Stranges points to Vice Commander Donn Thor and says, "this man is from Venus!" The tongue-in-cheek delivery in how Dr Frank told the story was both hilarious and informative at the same time. He probably didn't think much of it at the time, but what transpired is of high importance since it gives us an opportunity to contact Alda in hopes that he can corroborate the story and perhaps shed new insight on what it was like to talk to a high-ranking extraterrestrial from the interior of the planet Venus. Alan Alda who Dr Frank met on a plane ride with Donn Thor heard the tale and after talking to Donn on the trip ran up to them as they exited and said "You know I have heard stuff like this before but you 2 guys i really do believe what you say!" Posted in Dr Frank E Stranges, Events, Human-looking extra terrestrials, Stranger at the Pentagon, Venusians. Tags: Adam Milat-Meyer, alan alda, alien encounter, close encounter, donn thor on September 30, 2015 by Adam Milat-Meyer.